Planning a trip to paradise on South Padre Island! We are here to help with all your South Padre Island transportation needs on how to get to and from the nearby airports, using the local transportation and shuttle services and the fun recreational transportation rentals available to you on the Island. The Brownsville / South Padre Island Airport offers a free shuttle service to and from the airport, see the schedule here. It is about an hour trip using the free shuttle from the Brownsville airport to South Padre Island. The South Padre Shuttle service from the Valley International Airport in Harlingen, operated by LogistiCorp, is a door to door service from the Harlingen Airport to your personal condo. You will enjoy a comfortable 50-minute ride to South Padre Island with fully reclining seats, air conditioning, full windows to take in the sights, and video screens to keep you entertained. Shuttles have overhead bins and racks to store luggage and are ADA compliant with wheelchair lifts. The South Padre Shuttle fare is $25 one-way or $45 round trip. Recommend guests pre-book a reservation to guarantee a seat on one of three 24-passenger shuttles. Walk-ups are welcome however a seat is not guaranteed. The reservation counter is in the baggage claim area of the airport. Click here to reserve your spot now or call (877) 774-0050 to speak with a travel agent available 24/7. Credit cards or cash are accepted at the reservation counter or directly on the South Padre Shuttle. The McAllen International Airport is approximately 90 minutes from South Padre Island. Taxi services from McAllen are your best option. View Taxi services available to you at the bottom of this page. South Padre Island is less than half a mile wide and the populated areas cover less than 5 miles. You will be able to walk to many activities and adventures along the island. To assist you in experiencing adventures further along the Island, the City of South Padre Island offers convenient free South Padre Island transportation on the city shuttle, The Island Metro, formerly known as The Wave. 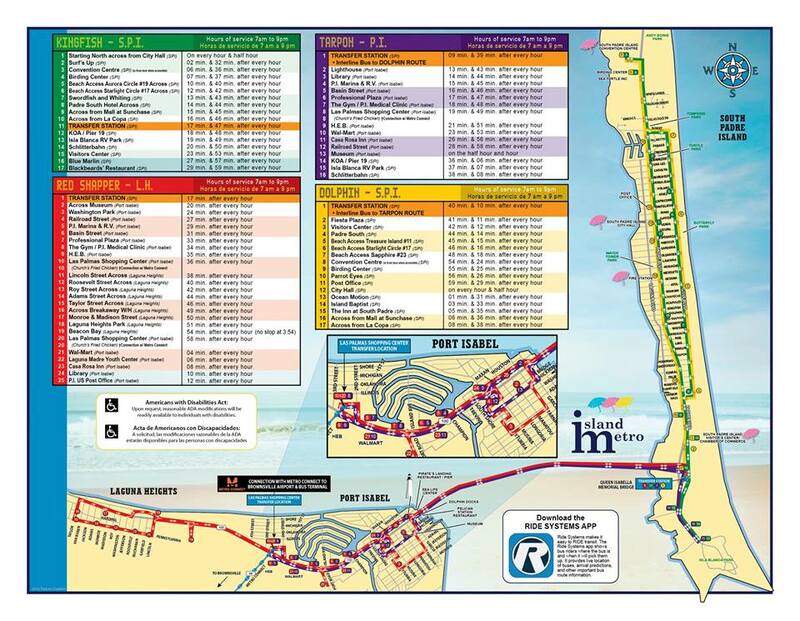 The Island Metro offers different routes, one goes up and down South Padre Island and another route crosses the Queen Isabella Causeway to Port Isabel. Be sure to pay attention to the bus routes so you arrive at the right destination. See routes and schedules here or call (956) 761-8178. To inquire about ADA paratransit services, call Public Works at (965) 761-1025. Each Island Metro shuttle offers complimentary WIFI, is equipped with a bicycle rack and are ADA accessible with a wheelchair lift. You will find Island Metro shuttle stops at many hotels, restaurants, beach assesses and popular spots along the Island and Port Isabel. However, if you need a ride and the Island Metro shuttle is headed your way, cautiously approach the street and wave the shuttle down. The Island Metro’s “Red Snapper” and “Tarpon” routes cross over the Queen Isabella Causeway to Port Isabel to a variety of shopping centers including HEB grocery store and Walmart. The farthest destination point is Las Palmas Shopping Center where connections can be made to communities all over the Rio Grande Valley through Metro Connect transit partners. 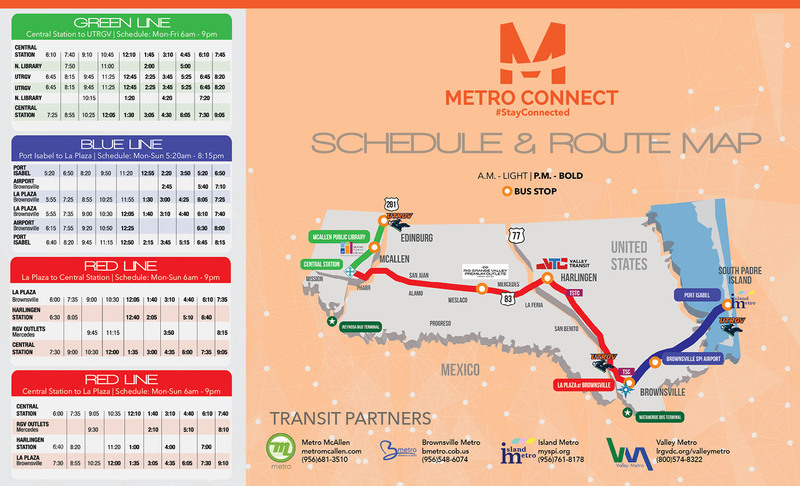 See routes and schedules below or visit Metro Connect. Remember Padre Island Rentals is here to assist you with any need you may have, we operate a 24-hour front desk, (800) 926-6926. Should you have issues on one of your beach strolls or taxi nights out and lose keys, we are here to help. There will be a fee for a new key, of course, so be careful.